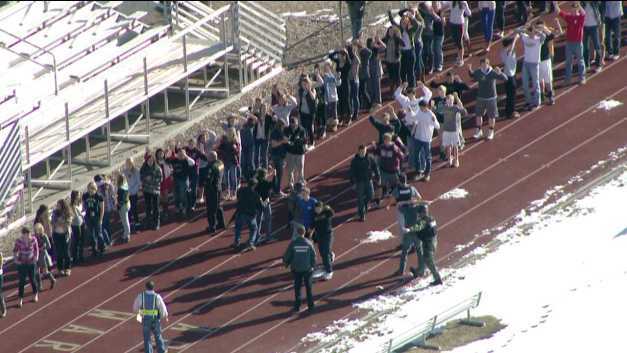 A student at Arapahoe High School in Colorado shot and wounded another student before dying of an apparent self-inflicted gunshot wound, police have said. The shooting occurred the day before the anniversary of the shooting in Newtown, Connecticut, in which 20 schoolchildren and six workers were killed at a primary school. The teacher left the school after learning he or she was sought. Another student suffered a minor injury. The school and others in the area were placed on lockdown. Upon the initial reports of a shooting, heavily armed police trained in “active shooter” scenarios stormed the building, ordering students outside with their hands over their heads. Inside, they found the dead suspected gunman and two other injured students, one of whom had suffered a minor wound, Arapahoe County Sheriff Grayson Robinson said. Police have not yet released the name of the suspect. The school has more than 2,200 students and 70 classrooms. The building is just 8 miles east of Columbine High School in Littleton, Colorado, the site of a mass school shooting in April 1999 which left 14 students dead.